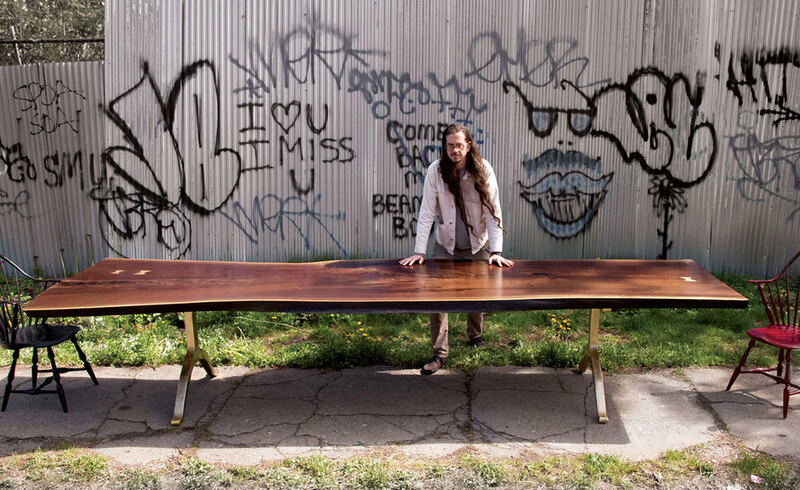 SENTIENT live edge tables are made using sustainably-sourced American black walnut, spalted maple, cherry, oak and occasionally other hardwoods. We source our live edge pieces from family-owned mills in Pennsylvania and other areas within the United States. Each table top is protected with several coats of deep sealer, and also preserved with top finishing coats. 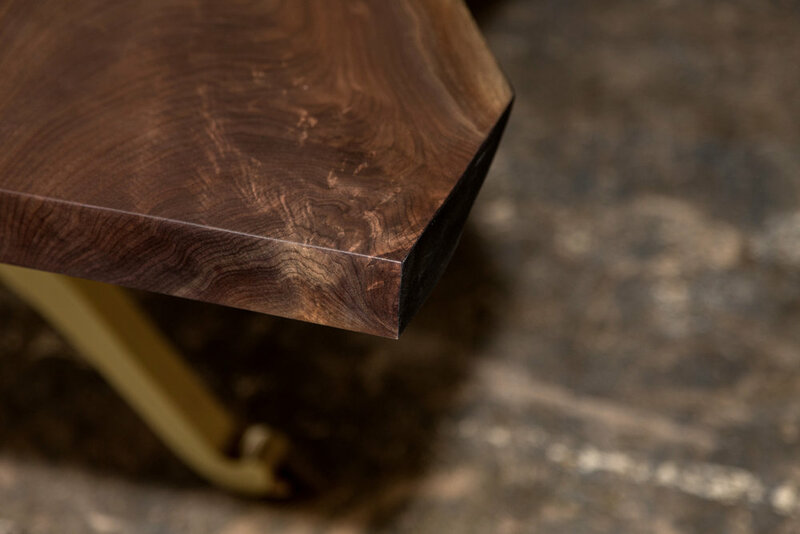 This process brings out and accentuates the beauty of the grain patterns and other naturally-occurring characteristics that are particularly noticeable in our black walnut. The Process: Masterful craftsmanship from start to finish. 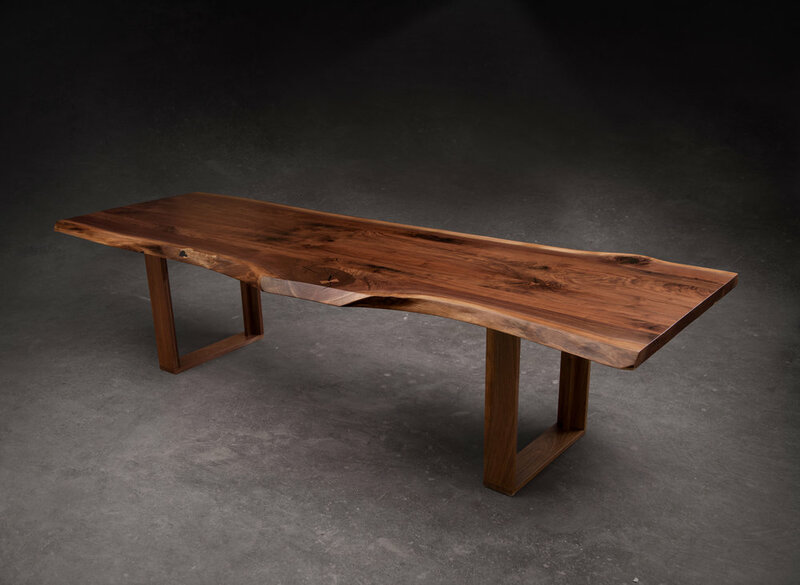 SENTIENT solid wood live edge tables are made from American black walnut, white oak. spalted maple and occasionally other hardwoods. The logs and slabs are sourced mainly from the eastern United states. Slabs are air dried for a period of up to two years. Residual moisture is removed in a heated kiln which may take an additional three months. The slabs are then planed. They spend up to a month acclimation period in the workshop in Brooklyn before we begin to transform a raw slab into a beautiful table. Table top: Live Edge American Black Walnut. Also available in Maple, Cherry and Oak. Dimensions: Typically 70” - 168” wide x 30 - 60” deep and larger on request. 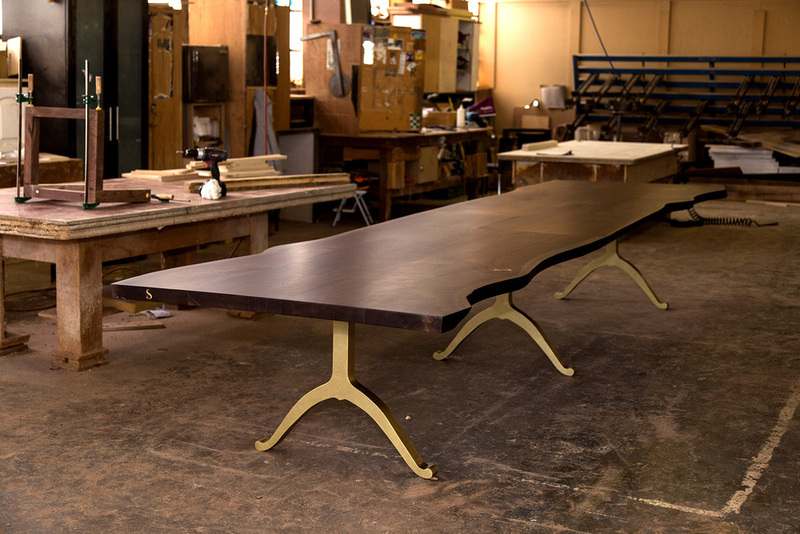 A SENTIENT table is designed and fabricated after discussions with each customer. These discussions are informative, collaborative, instructive as well as ressuring and fun. Typically, the customer provides a general indication of size, leg choice, wood species as well as butterflies and other details. A computer rendering of the table showing all specifications and final details is prepared and submitted to the customer for approval. At this point we are ready to commence the hard work of fabricating the table. Our finishing process is focused on bringing out the timeless beauty of the wood grain and color that are found within the wood itself, and our workshop has developed a water-based clear finish that we feel is the best option when purchasing a SENTIENT Signature Live Edge Table. When running your hand over the tabletop, you can still feel the grains of the actual wood, yet it is protected. The subtle yet striking details in the wood itself is brought out by applying several coatings of the finish, then sanding, and repeated many, many times. It is a deep finish that looks extraordinarily clear and minimal. When all fabrication and finishing has been completed, each table is assembled and inspected. Once approved, they are disassembled, wrapped and either scheduled for local delivery or packed into a sturdy shipping crate for delivery outside the Tristate area.